Source: Asia, Mexico and the United States. 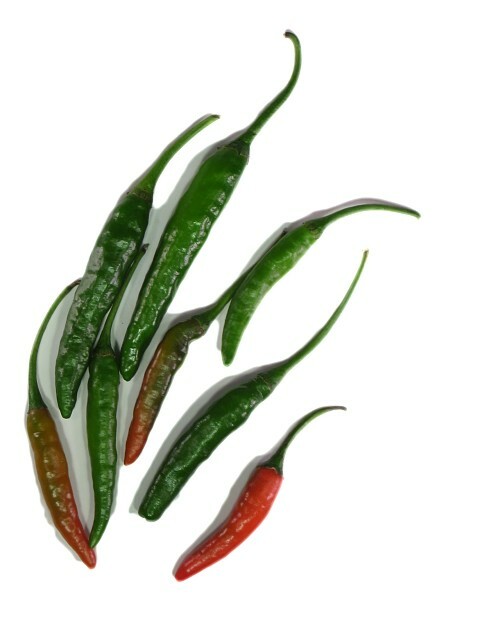 General Information: Also known as birdseye chile peppers, these are small and one of the strongest varieties available. Only about 1 to 1-1/2 inches long and 1/4 inch in diameter, these diminutive chiles are little firecrackers! Very hot with a fast, clear and lasting explosion of heat; a bit acidic too. The fiery punch does not dissipate with cooking. The thin-fleshed Thai chile ranges in color from green to red when fully ripe. It's a popular addition in many Southeast Asian dishes. Used in many Thai soups and curries.